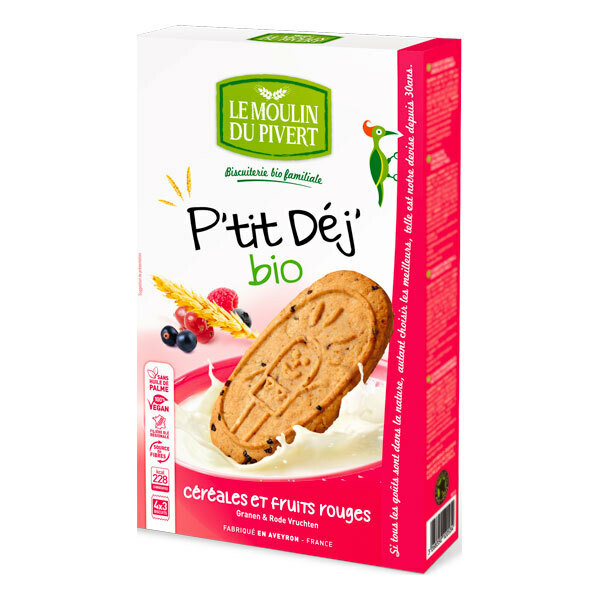 What more delicious than berry and cereal biscuits made in France without GMO? Delicious for breakfast! Ingredients: * Cereals (gluten) 53.3% (wheat flour T65 *, oats *, * T130 rye flour, barley flour *), sunflower oil *, unrefined cane sugar *, glucose syrup -fructose corn *, cocoa butter *, * 1.5% cranberries, blueberries Preparation * 1.5% (apple puree *, unrefined cane sugar *, wheat syrup *, mashed blueberries * 20%, concentrated lemon juice *, natural flavor *) preparation raspberry * 1.5% (* Applesauce, unrefined cane sugar *, wheat syrup *, raspberry puree * 20% juice concentrated lemon *, natural flavor *, elderberry juice concentrate *), raspberry extract *, oat fiber *, raising agents: sodium bicarbonate and ammonium bicarbonate, blackcurrant pieces *, salt, lemon juice * concentrated.